Painting your kitchen is a personal experience! Do not begin the painting project without giving thorough thought to the color choices. Understand how each color makes you feel about the cooking area, learn a few handy tips for a successful painting job and only then, you will be able to enjoy the kitchen of your dreams! A perfect color palette goes a long way in improving the look and feel of any room. If you want to add some sparkle to the dull, lifeless kitchen, consider repainting it. When you do not have the budget for a complete kitchen renovation, it is best to stick to an affordable painting project that will bring you closer to the kitchen of your dreams. The perfect color combination helps you in enhancing the visual appeal of the cooking area. Check out a few popular kitchen painting tips so that you get more bang for your bucks. Every room has a vibe. When you are in the process of painting a kitchen, make sure that you think of the overall look of the property. The kitchen should not look like a separate entity. If you have a tiny cooking area, it becomes all the more essential to merge the adjacent spaces and maintain a streamlined look throughout your home. So, consider the theme of the other parts of your home. Does your home have a modern, minimalistic vibe or does it have an old-world charm? Once you are sure of the look that you want for the kitchen, choosing the colors will become easy for you. You may love the existing bright yellow kitchen cabinets but if they do not go well with the warm brown color on the wall, the entire painting project will transform into a disaster. Not only should you focus on adjacent rooms but you must also look around the kitchen for inspiration. 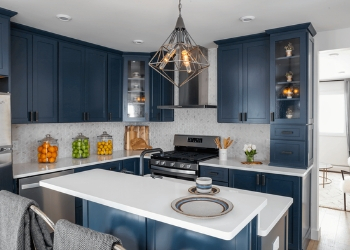 For a dream kitchen, make sure that you color coordinate different elements of the kitchen including walls, backsplash, countertops, kitchen island, kitchen appliances, etc. If you have a limited budget of painting only the walls, choose a color that matches all the other elements in the room. Warm or Cool – What is your Choice? If you want a large room to feel cozy, warm colors such as red, orange and yellow are the perfect options. Yellow can bring in the energy that you require to brighten up a dull kitchen. If you do not want to apply bold colors on the walls, you can go for brown shade or opt for neutrals such as grey and creamy white. Cooler shades including blue, green and purple can make the kitchen area appear calm. If you are looking for walls that soothe you and have a calming effect on you, a blue kitchen is the answer. The kitchen is a high-traffic area so avoid using flat, eggshell and satin finishes. Food splatter, liquid spills and oil stains are very common in a busy kitchen so make sure you choose a semi-gloss finish or opt for a glossy finish. If you have a small kitchen, use lighter shades that reflect natural light. White doesn’t have to be boring. Use white on the walls and add a pop of color by painting the kitchen cabinets/island in a bright color. You can add a chalkboard wall to the kitchen to give it a rustic feel. It can become a great talking point for your family members as well as guests. Do not shy away from using colors. If you are confused about a color combination, work with a color consultant to get a clear picture. Alternatively, consider online color selection tools to make the right decision. If the paint on the walls is relatively new and you just need the painter to fix a few nail pops and paint the trims, you can hire one-day painter services. An average kitchen painting job can cost $300-$800 depending on the work involved. Add another $1000 to your budget if you want to paint the cabinets. Your cost may fluctuate because of several factors so, obtain an accurate estimate to avoid any surprises later. Do not be in a hurry to finish the kitchen painting job. Spend time knowing what kind of colors you want for the cooking area. Remember building your dream kitchen is easy when you are clear about your needs. If you do not spend a large amount of time in the kitchen, avoid personalizing it. On the other hand, if you love to cook, make it your personal little paradise by choosing colors that suit your personality. Work with a reputed kitchen painter to ensure beautiful color choice and incredible painting results. Are you looking to upgrade the look of your kitchen? Hire the best kitchen painters of Toronto. Work with Perfect Painter to ensure a perfect-looking kitchen. Get in touch with us for all types of interior home painting and exterior house painting services.